Last week I had the chance to test out the JamesDonkey Pro Gaming Mouse. With an Avago A9800 laser sensor and a sleek design, the James Donkey Pro has a high quality build, but there are several things the company needs to address immediately if it plans to cater to Western customers. Okay so, there’s a couple very, very important things you need to know about this mouse. The first thing I do with any mouse is look at the instructions. When I opened up the JamesDonkey, it was brought to my attention that the instructions were in Chinese! That’s no good if you don’t speak or read Chinese. Having installed plenty of mice before, the useless instructions didn’t prevent me from moving forward, but come on, JamesDonkey. When I went to install the software, I realized that JamesDonkey didn’t include a CD-rom. That’s not unusual and a lot more gaming mice companies are keeping their software online to save costs and reduce packaging. Besides, most CD’s get thrown around and easily scratched up. So, why not just keep it all easily accessible online? Nope. JamesDonkey’s official website is extremely hard to find. I spent around half an hour looking for it on three different search engines. Not one of them placed JamesDonkey on the first page and with a unique name like that, you’d think it’d be an easy Google search. After the troublesome journey to find the official JamesDonkey website, I found out it was in Chinese. It was starting to get frustrating at this point. Luckily for me I have a friend from China and he was able to get me started, but as for everyone else, you’ve got to be aware of these mistakes on JamesDonkey’s part. Putting the frustrating software and instructions aside, the JamesDonkey Pro gaming mouse has a lot of nice features. Now, I know I mentioned that the Avago A9800 laser sensor was a nice touch. But if you’re playing CS:GO then you won’t be thanking the laser sensor. I tried to play CS for about half an hour with the mouse and the laser only prevented me from making quick and fluid movements. 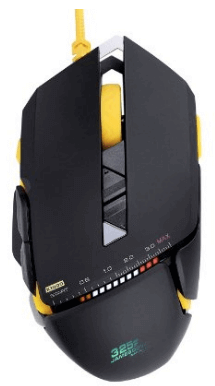 If you’re never planning to get into the whole CS lifestyle, then this mouse still might work for you—if you also have knowledge of the Chinese language. This is a wired mouse and I generally found it to be both long and short enough for my needs. The braided mouse cable is 1.8 meters. It’s suited with a JD connector, which is known to be of high quality. I’m never playing more than 4 feet away from my computer and neither are most gamers, so in this regard, nearly everyone should be fine with the JamesDonkey Pro. 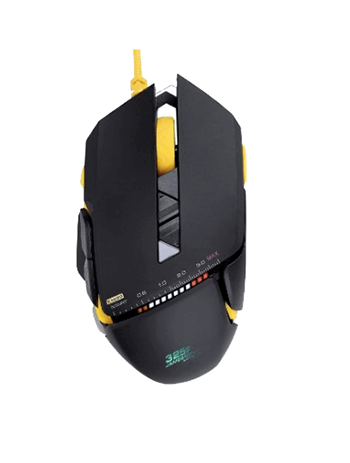 The JamesDonkey Pro has 5 DPI settings from 600 to 8200, which works for most gamers. I like to keep my DPI at around 5000 for WoW and League of Legends. Ergonomically, the mouse is designed for a right-hand. The grip is a smooth plastic. I didn’t find it too slippery, but my hands don’t get very sweaty. If you do, then you may run into some problems with the plastic grip. The scroll wheel has a rubber covering to make it easier to grip for long periods of time. This is always a nice feature of any gaming mouse that’s going to be in use for more than an hour. The JamesDonkey Pro also has several buttons. To be specific, it has 7 programmable buttons as well as the DPI buttons. Two main buttons sit on the main unit. There are also two thumb buttons on the left side for the right hand design. The scroll wheel has a raised pattern and right below this there are several buttons that control the profile and DPI options. And then there’s the quality. 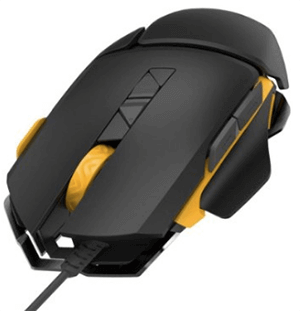 This is where the JamesDonkey Pro beats out other mice in its mid-range price level. The mouse weighs in at 5.3 ounces, which is a tad heavy as far as gaming mice go. Personally, I prefer a heavier mouse to a lighter one. JamesDonkey claims to have tested the mouse for 20 million clicks. If you ask me, that’s a pretty durable mouse. It also just feels durable. Clicking was a breeze and felt durable to the touch. Not too sensitive and not too difficult. The solid metal plate that sits on the bottom of the mouse is thick and durable. Overall, the JamesDonkey Pro is built to last through rough traveling and long periods of use. Some other minor features include the light, vibration, and sound settings. These are all programmable in the software, if you can get it installed properly. There are LEDs on both sides of the mouse as well as in the front. Additionally, several LED lights in the center of the mouse light up during gameplay. Compared to other mouse brands, I found the JamesDonkey to match-up in terms of build and quality. That said, the company still has a lot of kinks to work out as far as user-friendliness. Remember, only consider buying this mouse if you want to deal with the Chinese instructions and difficult-to-install software.